With the simple use of saline solution, Nasaline effectively washes away unwanted mucus, crusty secretions or allergens and provides relief from symptoms associated with allergies, colds, the flu and other sinus related infections. After a prolonged stay in dry, dusty, or smoky environments, Nasaline cleans and soothes the nasal passages, reducing nasal irritation and moistening the mucous membranes. Consult your health professional before use. Prevention of sinus related infections*. Drug-free relief from pregnancy congestion*. Follow-up treatment to sinus or nose surgery*. use of cold medicines such as nose sprays and drops*. Recommendations: Use as directed to help decongest and drain blocked nasal passages and provides relief from symptoms associated with allergies, common colds, sinus infections or the flu. 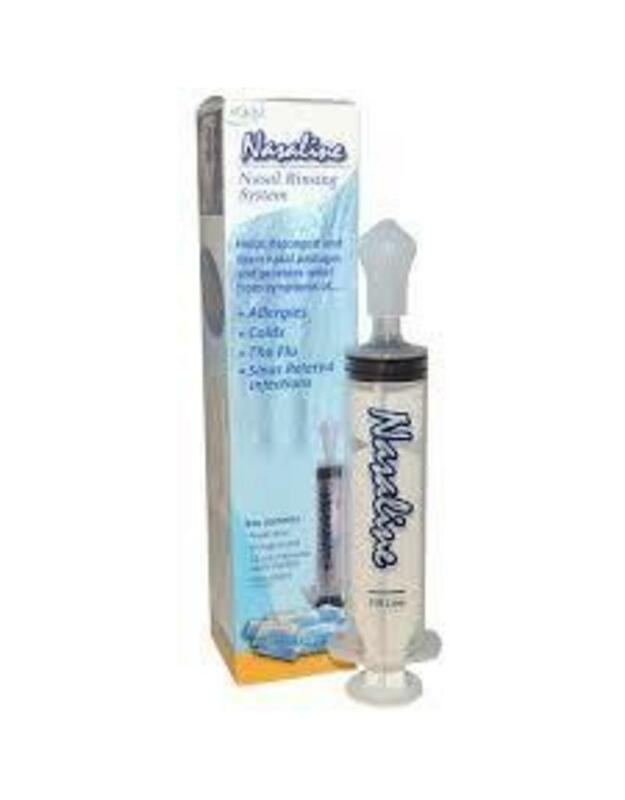 Dosage: Use two(2) full syringes twice in each nostril per rinsing session. Rinse once or twice daily or as recommended by your doctor. Cleaning Equipment: Remove the tip, pull out the plunger and flush all 3 parts with warm water - let air dry. The Nasaline applicator can also be cleaned with a mild dishwashing detergent. When not in use, we recommend that you store the Nasaline applicator with the plunger inserted into the cylinder to prevent the rubber surrounding the plunger from swelling. If the plunger does not easily slide back into the chamber, put a drop of olive oil on the plunger's black rubber ring. Important Facts about the Saline Solution: Use distilled or sterilized water. The saline solution should be at or close to body temperature. Once mixed, use the saline solution within 24 hours or discard. Caution: Rinsing with plain water (without salt) will result in a burning sensation. Do not rinse with hot water or you may burn yourself.